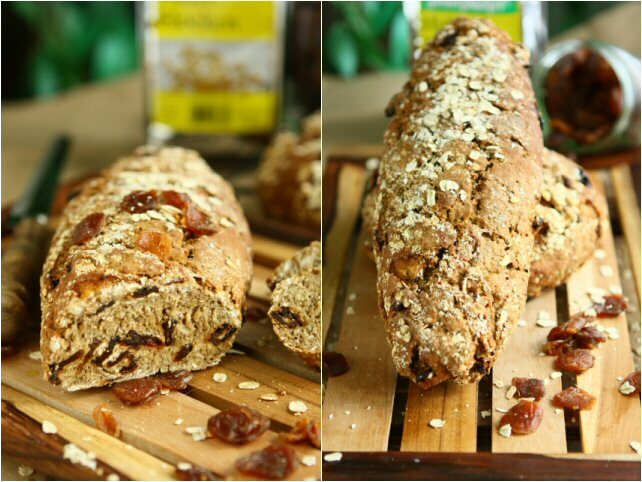 The earthy flavour of dark rye, nuttiness of rolled oats, offsetting sweetness of dried longan flesh combine to make a dark brown bread that has rich hearty flavour and a dense chewy texture. Serve, lightly buttered, as a breakfast or as after-school snack. Dried longans (“dragon eyes”) are high in iron, fiber, and considered to help with insomnia, stomach ache and to improve memory. Many Chinese believe longans can be used as an antidote for poison, and as a blood tonic, to nurture the heart and to add luster and beauty to the skin. You can purchase dried longans in most Asian supermarkets. Place dark rye flour in a large mixing bowl and make a well in the center. Crumble the fresh yeast and place them in a bowl together with sugar. Dissolve with 100 ml lukewarm water. Now put the yeast mixture into the flour well. Mix in some flour until it resembles thick porridge. Cover this starter and leave it aside for 30 minutes. Add in sea salt and the rest of the water. Stir until a pliable dough forms. Turn it out onto a floured work surface. Knead firmly, with floured hands, for 5 minutes. Shape the dough into a ball, covered, and proof at room temperature for about 60 minutes. Knead the dried longan flesh and rolled oats into the dough. Divide the dough into two portions. Shape them into a baton and boule. Place them on the baking tray lined with parchment paper. Cover and proof for 30 minutes at room temperature. Place a tray of water at the bottom of oven. Preheat the oven to 180C/350F. Bake the bread for 1 hour at the lower rack. Cool the bread on a rack. Another tempting recipe from uuuuuuu..Yumm. Those fabulous loaves of bread sure looks better than the one being sold here :D Delicious and healthy to boot ! It looks divine!A must try!Have a lovely week,dear! My hubby would absolutely love this Angie. Wowo you are a wonderful bread maker and this looks so good. A fabulous bread! Very original and really tasty looking. U rock with fabulous breads, simply loving it. I've never Thought of making rye bread but this sounds so good. Plus Longan's are something I've never heard of before but after reading of their benefits I think I need to stock up. Thanks for sharing this yummy recipe. What hearty looking rustic bread! I have had plain rye and the addition here of the longans does peak my interest. Firstly because I have never eaten that fruit and secondly because it seems that I am always buying some exotic kind of bread at the specialty store. The hubs tells me I need to make some because it is pretty expensive. Enjoy the day. when I am not playing with sourdough, I love to use fresh yeast. this bread look so perfect for a healthy and yummi breakfast and I was already thinking to try doing something with rye. I may substitute the logans with dried cranberries, do you think it would work? I've never had dried longans, only fresh. But their sweetness would be fantastic in this lovely bread. Rye is my favorite bread I have never seen a better looking loaf of it! BRAVO! I love that combination of that dark heartiness and sweet lightness of one of my favorite fruits! I've never heard of longans before . . . dragon's eyes, huh? Very interesting. I've never had luck working with rye. Love it, though. You've encouraged me to try again! What a gorgeous and hearty bread, Angie. I'm wondering if logans are similar to dates. What a beautiful, wholesome bread! This looks wonderful, Angie. I have never heard of longans but what a beautiful bread! I adore dense, chewy breads...yours looks amazing!!! The loaves look fabulous. You come up with such a great variety of healthy recipes that always look absolutely delicious. What a beautiful bread! I've never head of longan before so I had to Google it :) I wish I had a nice, big slice for my lunch right now. @Soni More like lychee...but you can use dates instead for this recipe. Can I just buy all of my baked goods for you? Just name the price! :) This bread looks scrumptious and so healthy to boot! Beautiful loaf! @My Italian Smörgåsbord Sure..raisins or dates would work great too. Mmm... this is heaven in the morning with some nice jam on top! Gosh this bread looks so tasty! I love this bread! It must be delicious!! I'd eat it plain for dinner! Love how hearty and wholesome this looks, while still having a good bit of sweetness from the dried fruits! I would be so happy to just munch on this plain, no toasting or additional spreads needed. Great bread, I have had longangs fresh but never saw them dry. This must taste really fantastic! wow, this is a true longan bread..with so much longans and a bread packed with nutrients! add beauty to our skin?? i want!! Wow..the loaf looks so rustic! Wonderful crust, quite filling bread. Your bread turned out perfectly! Good idea to use longans in bread! Just like raisin and other dried fruits huh! Looks really healthy! So interesting! Lovely loaves - really beautiful. Your photography astounds me. I hope you get paid for these beautiful presentations! Have a great week Angie. this is such a beautiful, rustic loaf of bread - love it! I love homemade bread, my most vivid childhood memories are of my grandma baking bread, the smell, the perfect taste of warm fresh bread is just so amazing and comforting! I love that yours looks so loaded with different delicious things! Dried longans…we normally use them to make dessert. I don’t think I’ve ever seen them in bread before. But hey why not…it’ll give the bread a nice sweet aromatic flavor. You’ve made baking bread look so easy! Another gorgeous and delicious bread that I would love to try! I'm so impressed with the ingredients, and the perfect loaves...too good to be "true" this kind of bread can only be found in the fanciest gourmet bakeries! You always make the most amazing bread..... This looks fantastic. My mother gave me some longans to eat as I don't always sleep well and she thinks I always need more fiber lol. I've really been meaning to make a rye bread...this loaf in particular looks just perfect! You always make the most amazing looking breads!! This bread sounds like the perfect comfort food. Thanks for sharing the recipe! What a beautiful, hearty bread! Love the addition of oats, Angie. This bread looks so good... I love the colours... Yum. I've never tried longans, but I do love dried fruit in bread. I'll have to see if I can find them around here! After seeing your bread, it's a must try to use dried longan in my bread too. Thanks for sharing, Angie! This looks delicious--I will have to look for dried longans next time I am shopping in Chinatown. You have the most intriguing recipes, and the most beautiful ones! This bread looks wonderful. I can eat bread like this for a meal but I enjoy it most with butter and jam....served up with a cup of coffee. I have never heard of a Longan (except for a couple of friends that have that last name!) This bread looks delicious and I would like a warm piece for breakfast in the morning, thank you very much! Beautiful loaf of bread, never thought of adding dried longans to bread! Lovely! This is such a healthy and rustic looking bread!! love it!! soo glad I discovered your blog!!! Haha! I've been toying with the idea of a longan loaf for a while now, and you've convinced me I should do it! I love snacking on dried longans and making longan tea, but didn't know it had so many health benefits. Lustrous skin?? Oh my, where are my dried longans??? ;) Gorgeous pics Angie!! Hope you're having a great week ahead, dear. I've to scour my market for some dried longan. I've only seen it in cans. What a great idea to add it to such a hearty and beautiful loaf of bread. I love this bread, it looks so hearty. I have not seen dried longan around here..I must keep an eye out for them. if i substitute some rye flour with bread flour, do i need to reduce amount of yeast? @Anonymous I don't think it's necessary to cut down the amount of fresh yeast..but you might need to adjust the amount of water...depends on the bread flour you use.